The best destination wedding advices about Tuscany. Tuscany is considered one of the best destinations for weddings abroad and here’s why. As well as being the cradle of the Italian language and culture, Tuscany is a paradise-like place to experience, relax and enjoy. Beautiful Renaissance cities but also places that are pure nature consisting of long roads bordered by wheat fields, vineyards, olive groves and much more. Super Tuscan Wedding Planners will give you the chance to get to know this land in all its beauty. We love Tuscany and we’ll make sure you love it too! We’ll show you the best spots within the Tuscan cities, the most amazing pieces of classical art and the top cafés and restaurants around. Then you can relax by trying some tasty wine, see some of the most stunning views out there, feel the magic of this land whilst strolling amongst vineyards and olive orchards, go to the top of a beutiful green hill and feel like you’re walking amongst the clouds. We’re experts at creating weddings under the Tuscan sun and we will find the perfect venue for you according to your needs. We devote the same attention to small groups as we do to the larger ones: we’ll manage all transfers from/to airport, rehearsal dinner, parties to entertain you and your guests during your stay and all management necessary in order for everything to run smoothly and make sure your wedding is exactly as you envisioned it! We can organize your wedding just as you want it, be it a stylish ceremony in a Renaissance villa on the top of a hill overlooking Florence (read more about Florence here! ), a luxurious wedding in a high-class hall in the centre of Florence or Siena, a romantic a candlelit wedding under the stars surrounded by scented vineyards, a castle wedding in an original medieval castle in the woods. There are some amazing accommodation options, beautiful locations to give your wedding ceremony the feel you desire, be it religious, civil or symbolic. The wedding reception will be carefully planned to offer the best quality services and the best food. And we’ll be there to help you and suggest the best solutions for any details you want to include on your wedding day. 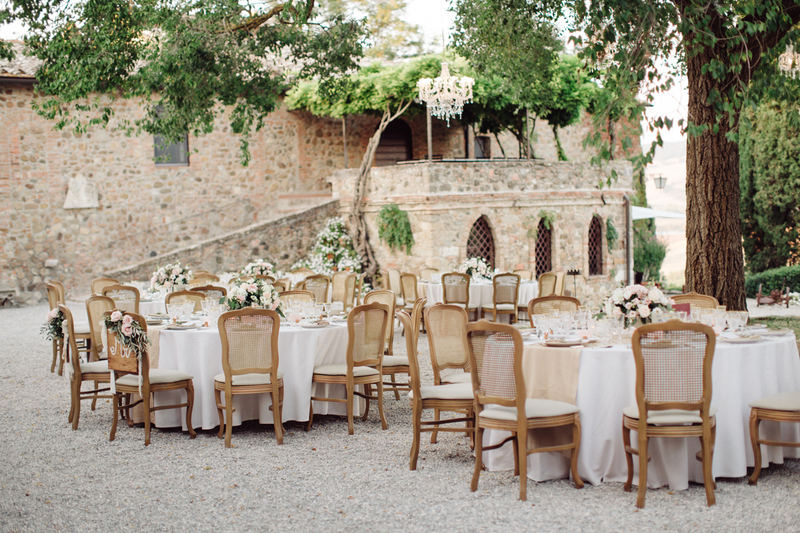 If you want to discover more about the destination weddings in Tuscany, read more here. Visit Tuscany and experience a unique, Italian style wedding with Super Tuscan Wedding Planners. Find out more: contact us for more destination wedding advice! We are looking for a wedding for 100 people at a Tuscan villa in May 2017. Please can you help? We can definitely help you. I will send you an email in order to understand your needs. We are starting to plan our wedding for late summer 2017. We are looking for an area in Italy that has a mix of a beautiful large venue (circa 200), close to a town/village and beside the sea or a lake. We are both Catholic so would be looking for a church ceremony. We estimate our budget will be circa £30,000. thanks for your comment! We’ll definitely be able to help you! An email fo ourse coming! Planning our wedding in August2019, since we are planning to do it abroad (Tuscany) I would like as much information as I can get. I’m a Catholic but partner is Church of England. We would like to get married in church. What document do we need? Plan to invite less than 150 people. looking for some villas, vineyards? i would like to know your prices? estimate budget 15k – 20k. Hi QUeenie, thanks for your request! I’ve just sent you an email with a first answer. Please let us know when we can talk together! That’ll be really helpful! We am looking to plan a wedding for August 2018 for between 50-70 people, estimated budget 10-15,000. Is this possible? Hi Francesca, thanks for your email! I’m answering now via email. Sorry for ou late reply but we don’t receive emails when a comment is posted. We are planning a wedding for May/June 2018 to take place in Tuscany. We are looking for a Palladian villa with a beautiful garden that would accommodate 40-50 people. We would need our wedding planner to organise literally everything from flowers to music and the priest (with an interpreter). We are planning to get a civil marriage certificate in the UK and then come and have a protestant wedding ceremony in Tuscany. Please email me if you have anything in mind with the estimate cost. I note that in the costs section you say that the cost depends on the time invested – does that mean that you would charge on hourly basis? Would we know the fixed cost in advance of signing an agreement with you? thanks for the message and sorry for the late reply. We just saw your email. Wish you a lovely day and we’ll get back asap! We are planning our wedding for 2018 and we’re recommended to you by a friend to assist based on their great experience. Can you share more information with respect to your fees and service? Thanks for share detail information. Italy is so beautiful and affordable for those who have Destination Wedding plan. I’m looking to have a villa/ farmhouse wedding in Tuscany for 30-40 people in October 2019. I don’t want to spend more than 6k- is this possible?? Thank you for your request and congratulations for your engagement! I’ve sent an email to you!